POPULAR WINDOW STYLES FOR YOUR BRAMPTON HOME! 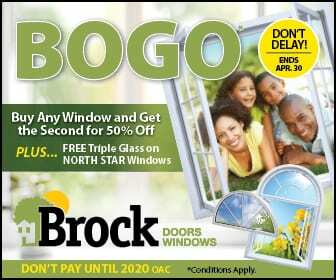 Brock Doors & Windows Ltd. POPULAR WINDOW STYLES FOR YOUR BRAMPTON HOME! These have been around for quite a while and are very popular in new homes. Their panes swing outward to let air in by using side hinges with small handles which control the open/close. These are great additions in hard-to-reach places—like over the kitchen sink or mantle! As mentioned, this style is often found in new homes, but they are aesthetically versatile and look great almost any home structure. Very common and popular with all generations of homeowners. The movable portions allow for great ventilation. Plus, the sashes (panes) lean in on many double-hung options which allow for a very easy clean as needed. This style is perfect for older homes and newer structures alike! Many of you reading this right now already have these in your home. Aren’t they great? For those of you who don’t know, sliding windows move horizontally on a track. One sash is stationary while the other moves side to side to open or close. Of course, there are multi-pane sliding windows with three or more sashes—with these, you will have more than one sash which slides to open and close. This style works really well in modern, contemporary, and traditional designs. This style window is multi-faceted and multi-use. It consists of a large center window (usually, this is a picture window which does not have any moving parts to open or close) which is flanked by two double-hung or casement windows. Depending on the dimensions, you will have a small to large amount of space to place flower pots, books, picture frames, or trinkets! This style works beautifully in any home—kitchens, master bedrooms, sunrooms, etc.! Just like the casement window style, awning windows are hinged to open outward. But, they open from the bottom or top (instead of the left or right). These are added to homes for a unique twist to the exterior and, if installed to open from the bottom, they keep out rainwater while allowing in natural light and fresh air. Cottage and antique or older-style structures are a perfect setting for this style window. If you are in the market to upgrade your home with replacement windows, the team here at Brock Doors and Windows would love to meet with you! There are even more styles than those listed in this article—come see them at our showroom! You can touch, operate, and check out various materials, glass options, and mechanisms while we help you co-design your new space. See you soon!